Apple iPad has finally been released to public. The fans kept waiting outside Apple app store all night before the iPad was made out to them the next day. The iPad was released on last saturday in United States. 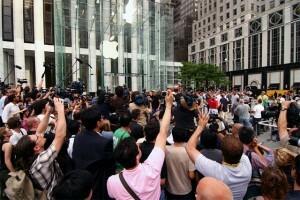 The mega event was welcomed by millions of fans who gathered in front of apple stores to get hand on the iPad. The desire to be the first one to get the iPad made them stay all night outside the store. Total of 51,000 units of iPad were sold in just first two hours which later on reduced to 1,000 units per hour. A total of 120,000 units of iPad were sold overall on the first day of its availability.